Though I'm a teenager and with such youth is supposed to come almost magical technological abilities, I am really quite clueless sometimes when it comes to the realm of computers. This fact was made manifest about two years ago. I was working on some design projects in Photoshop when I decided I was in desperate need of a new script font. Remember when Scriptina was all the rage? From the moment I saw first saw it, I knew we would be friends. I soon fell head over heels in love with the giant loopy letter h's and the gorgeous calligraphic lines that connected each elegant character. It seemed like the angels sung as I found the download package of my dreams-- not one, but two fonts for zero dollars and zero cents? Count. Me. In. Unfortunately, as I'm sure you're aware not everything on the internet is safe. Thus, one should always be careful when downloading files. I knew I should find a more reliable website and run a security scan on the file before I saved it on my computer, but I was busy. I wanted the font and I wanted it right then. As you can probably guess by now, I downloaded it. At first, everything seemed fine. Apparently the rules of internet security did not apply to my invincible computer. The grass was green, the sky was blue, and all was right in the world until about a week later. As fate would have it, the fonts did not come alone. Turns out my version of Scriptina loved partying with viruses and invited them to come along to the fiesta in my hard drive. Over the next few days, my computer started to get very glitchy. My Word documents saved wrong, I couldn't open some of my computer programs, and Internet Explorer was even slower than normal. I kept putting off taking my laptop in for a clean-up for a couple weeks. I figured It would magically fix itself, or maybe If I had the enthusiasm of this meme character I would some how figure out a way to get it working again all on my own. Finally my computer wouldn't even turn on. I knew I needed help. Red-faced and humiliated, I went to the store and confessed my error to the computer technician. To my surprise, she didn't laugh at me. She didn't gawk at my stupidity. She didn't yell at me for not running a security scan. She was kind and understanding. Before I knew it, my laptop was fixed and good as new. As I've thought about this experience more, I realized that sometimes we use the atonement like I used my laptop warranty plan. When we sin and mess up, rather than repenting and applying Christ's mercy to our lives, sometimes we put it off. Be it shame, guilt, business, pride, or whatever else-- sometimes we let things get in the way of making things right with the ultimate repair technician-- our Savior Jesus Christ. From the very minute I bought my computer, the warranty plan for it was already in place. Even with this great benefit, I didn't use it when I needed it most. Rather than going to get it fixed right away, I painstakingly dealt with a glitchy computer and ran it 'til it died. Let us not do this with our souls. There is no need for us to wallow in our shame, guilt, and pain. The price for our sins has already been paid by our loving and merciful brother, Jesus Christ. We need not be afraid to come unto Him. No matter how big our problem, He will help us fix it. Best of all, his repair jobs are even more complete than any computer tuneup will ever be. I love that phrase, "restored to its perfect frame". Just like my laptop ran smoothly again once I finally allowed the store to repair it, the atonement can heal our hearts and make all things new once more, if we let it. 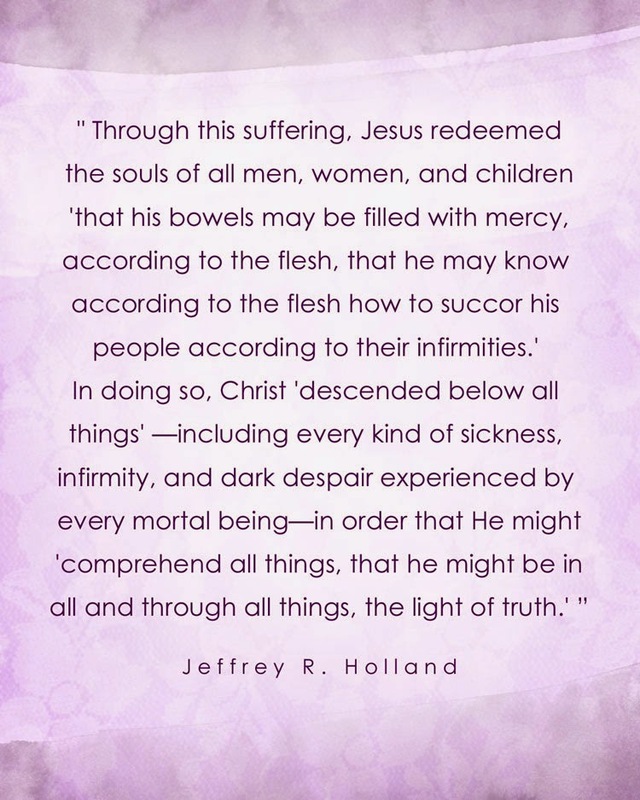 Our Savior suffered for each one of us. He knows our pain, sorrow, heartache, guilt, shame, and desperation better than anyone else because He's been there. He's felt it. He carried that pain so we wouldn't have to. Don't treat the atonement like I treated my laptop warranty plan. There is no need to wait for repentance. The price for our debts has already been paid. Let us come unto Him and be made whole. Beautiful post, and what wonderful reassurance that I needed to hear just now. Thank you.